Managing work and other commitments is never an easy thing to do. This is true also of managing your work life and studying English at the same time. Here are 7 useful ideas that you can use so that you can maximise your time and make sure that neither your work or your studying have to suffer. Knowing the syllabus that you are going to study before you start your English classes can help you plan your time wisely. Review the syllabus to know what to expect in your classes and to set aside time for topics that might require extra attention. A course schedule for your English lessons will also help you to see when homework assignments might be due, if there are any larger projects and when these will take place, as well as the all important exam dates. At first this idea might seem like you will be overwhelmed but trust us on this one. Keeping your schedule on one calendar means that you will never miss an important due date or deadline again. By keeping track of everything on one schedule you can gauge your time and availability more easily and know when you have more or less time to dedicate to something. Do you always leave your English homework or projects to the last minute? Or worse, do you sometimes forget to do them at all? Doing this not only affects your English grades but can also leave you tired at work because you stayed up too long or too late rushing to finish. Set yourself up for success by starting your English homework as soon as possible. Even if you can’t finish it all in one sitting, you can break the work down into smaller parts such as reading, vocabulary research, research, brainstorming etc. This will help you to begin and gain momentum for the homework or project. As mentioned before it is far easier to tackle projects when they are broken down into bite-size pieces. The same is also true for studying. You should try and approach both projects and studying in a similar way you would manage your tasks at work. Create a list of study tasks (this is where the syllabus could really come in handy) and set aside a specific amount of time for each task. Make sure that you don’t spend too much or too little time on each task and then move on so that you can cover all of the areas that you were supposed to. If needed you can then allocate more time at the end of the study session to cover something that wasn’t so clear. Follow this approach for homework and projects too – it might seem counter-intuitive to begin with as dedicating time to scheduling might seem a waste of time but since a lot of homework tasks will require taking the same steps, having your own homework and study system will save time. For example, most homework tasks will require reading, re-reading, research, and writing. You can allocate a certain amount of time to each task and note any tools or resources that help with each one. Do you have a long commute to work? Do you have a quiet lunch spot? You can use opportunities such as these to fit those small study tasks in or homework parts. We stressed the importance of clearly-defined tasks above because breaking down any studying or homework means that you can take any free time you might have to slot these small tasks in. How many English words can you learn if you take 15 minutes of your lunch break? Multiply that by 5 and that’s how many new words you could memorise in just 1 week! Being prepared in any circumstances can often offset a whole load of issues and problems. This is also true with studying. Now, there’s no need to plan everything months or weeks in advance but to study English effectively, you should pretty much have your work and study schedule mapped out for the week in advance. Since you have the syllabus and study tasks defined, you can take time at the end of the week to scheduled how you are going to tackle those tasks in the week ahead. Maybe traditional study methods just don’t cut it anymore or just don’t fit into your schedule. Most people nowadays don’t have hours in the evening dedicated to intensely studying English grammar books and actually there is no longer any need to haul around large, heavy textbooks due to advancements in technology. Find new ways that suit you, your study style and your schedule. Using an online learning program such as E-planet’s Learn English could be one solution as you can learn anywhere, anytime and study for as long or as little as you want. Finding new ways to study will not only help you to maintain a work/study balance but finding new ways of studying is motivating and most of all, fun! 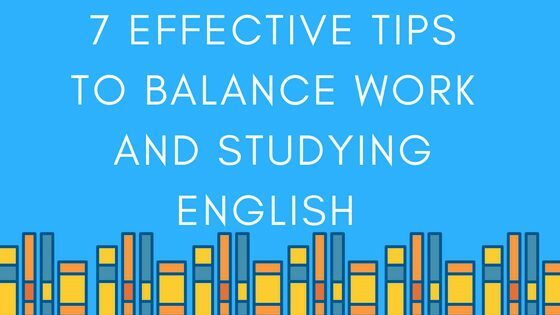 Do you have any tips on maintaining a good work and study balance? What are your favourite tips from this article? Let us know in the comments below, we’d love to know what you think!